INGREDIENTS LIST AND WHAT THEY ARE USED FOR, LISTED IN ALPHABETICAL ORDER. Castor oil is a natural plant oil obtained from the seed of the castor plant. The castor seed, or bean, is the source of numerous economically important products as one of the world's most important industrial oils, and was one of the earliest commercial products. Castor oil fights off infection by inhibiting the growth of bacteria and fungi, and the oil is also believed to have great anti-viral properties. It is an excellent anti-oxidant and contains many compounds which help to fight off the effects of aging. Castor oil for skin care is certainly one of the best natural skin tonics. Coconut oil is an excellent massage oil for the skin as well. It acts as an effective moisturizer on all types of skin, including dry skin. The benefit of coconut oil on the skin is comparable to that of mineral oil. Fortunately, unlike mineral oil, there is no chance of having any adverse side effects on the skin from the application of coconut oil. Coconut oil therefore is a safe solution for preventing dryness and flaking of skin. It also delays the appearance of wrinkles and sagging of skin which normally accompany aging. Coconut oil also helps in treating various skin problems including psoriasis,dermatitis, eczema and other skin infections. For that exact reason, coconut oil forms the base ingredient of various body care products like soaps, lotions, and creams that are used for skin care. Coconut oil also helps in preventing premature aging and degenerative diseases due to its well-known antioxidant properties. Emulsifying wax is one of the essential ingredients in making lotions and creams. Think of it as the “glue” that will hold your recipe together. We’ve all seen how oily salad dressings separate after sitting for a while. You then shake the bottle until it appears to be mixed, but if you look at it closely, you will see little balls of the oil suspended in the liquid. Left to sit, the dressing will again separate into its different properties. Lotions and creams are created from a mixture of water and oils. Without the addition of emulsifying wax, they too would separate back into water and oils. Adding emulsifying wax to your recipe will keep the oil and water from separating by creating an emulsion between the oil and water. An emulsion is a system consisting of a liquid dispersed in an immiscible liquid. Immiscible means not compatible: not able to mix together to make a solution. Oil and water are a great example of two immiscible liquids. Emulsifying wax will also thicken your creation. If it were not included in your recipe, you would end up with a mixture that is similar to the consistency of salad dressing! The fact that is also easily absorbs water from the surrounding air means that glycerin ishygroscopic. If some was to be left in the open, it would absorb water from the surrounding air until the liquid was eventually 20% water. A small amount placed on the tongue would cause blistering, because it is dehydrating. When beauty products containing this compound are used on skin that is well moisturized, it can help keep that moisture in. Goat’s milk soap is a very popular soap to make. You can make it with either fresh goat’s milk or you can use goat’s milk powder. The milk adds a creaminess to the soap and the sugars in the milk add to bubbly lather. Simply being exposed to the scent of lavender has been shown by scientific studies to be soothing to many people. It is commonly used to treat mild insomnia due to the relaxing effect that is commonly experienced with the lavender aroma. The "Cold Process" method is often used to make soap from lye. The lye is mixed with water, and then base oils, butters and fragrances are added. The gradual chemical reaction between the lye and the fats eventually produces a solid soap. At the end of the soap curing process all lye will have evaporated and will not be present in the soap. Olive oil is a fat obtained from the fruit of the olive tree, a traditional tree crop of the Mediterranean region, where whole olives are pressed to produce olive oil. Olive oil soap cleans your skin without stripping away the natural oils -- so you don't end up dry and flaky after it's use. Olive oil also allows the skin to sweat and shed cells naturally; commercial soaps that contain synthetic cleaners and fragrances can block your pores and cause irritation. Phenonip is a liquid, broad spectrum preservative with an INCI of INCI:Phenoxyethanol (and) Methylparaben (and) Ethylparaben (and) Butylparaben (and) Propylparaben (and) Isobutylparaben (click here for links on parabens). It can be used at 0.25% to 1.0% in all your creations, including anhydrous ones because some of these parabens are oil soluble! With all these parabens, it is considered a very powerful preservative, so it's suitable for those creations that might contain a ton of botanical or natural ingredients, like extracts or hydrosols. It's paraben based and it is not a formaldehyde donor. 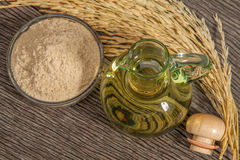 Rice Bran Oil (Oryza Sativa) is obtained during the process of milling the rice and comes from the bran of the rice kernel which is the part containing the most oil. Rice Bran Oil is considered by some to be the “worlds healthiest edible oil” containing many vitamins, antioxidants and nutrients. As Rice Bran Oil is particularly high in fatty acids it is very beneficial for mature, delicate and sensitive skin. The shelf life of rice bran oil is very good which helps to translate to a long shelf life for the products made from it. Rice Bran Oil has a small molecule which makes it easier to penetrate the skin. This gives it good penetration without being greasy. The fat of the nut of the African Shea tree (Vitellaria paradoxa) is the source of Shea butter. The traditional use of the butter is to reduce the appearance of fine lines, scars and stretch marks, and to ease a variety of skin irritations, such as psoriasis, eczema and sunburn. Makers of cosmetics also mix this natural substance with other botanical ingredients. Shea butter is ideal for the topical application of cosmetic and medicinal formulas, because it melts on contact and is readily absorbed into the skin, without leaving a greasy residue. Stearic acid is one of the useful types of saturated fatty acids that comes from many animal and vegetable fats and oils. Purified stearic acid is a waxy substance that is odorless and often takes the form of white or yellow waxy flakes. When it is heated, it becomes a clear liquid. It is one of the most commonly occurring fatty acids and is found in a number of animal fats and vegetable oils, including beef fat and cocoa butter. Sunflower oil is amongst the most commonly used oils today. It is derived from the seeds of the sunflower plant and is regarded as a high-quality oil, used in products ranging from hair and skin care to cooking oil. Suitable for all skin types, this oil is especially helpful in repairing dry, weather damaged skin. Once applied to the skin, it provides a protective barrier that holds in moisture and improves the skins appearance. It's light scent and texture make it a good choice for use in massage products or where quick absorption is required. The almond oil is a lightweight, golden-brown oil which is extracted from sweet almond nuts. 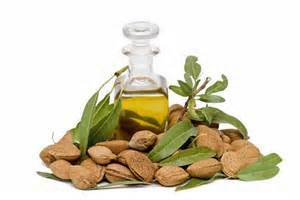 Sweet almond oil is one of the classic oils used to moisturize, nourish and soften dry or very dry skin. It is very popular as body oil due to its great spreadibility and a pleasant smell. In addition, it is used as cleansing oil in face treatments or added to face oils for extra moisturizing effects. Vitamin E is used in many natural and commercial beauty products, such as lotions and creams for skin. Applied directly to the skin, vitamin E encourages healing, and it is especially beneficial for sensitive skin.